My family knows that the coming of September heralds the coming of the Flu Bomb into our home. This mind blowing little recipe is something I picked up in Australia some years ago that I have found to be one of the most effective remedies for my family against stubborn colds, flus and even strep throat. While this “herbal soup” tends to be a little on the spicy side, the ingredients are specially chosen to address the many faces of those common autumnal ailments. Below is a quick overview of each of the splendiferous herbs that make this remedy so effective! Garlic is not only known to keep away vampires, it helps to keep away sickness! Consuming garlic regularly has been demonstrated to boost the immune system and help prevent the onset of colds and flus. Oregano and thyme have been famed throughout the Mediterranean for millennia for their antibacterial and immune boosting virtues. In fact, oregano essential oil has been shown to be the most effective of just about any natural substance at killing even stubborn bacteria. Sea salt, especially Pink Himalayan Salt and Celtic Salt, provide upwards of 80 natural minerals and electrolytes that help prevent dehydration and keep the body cool during fevers. Cayenne pepper and ginger work wonders for soothing sore and inflamed throats and killing infections of the tonsils and adenoids. While the first gulp may feel hot on the throat, the result is a reduction in irritation and some blessed relief from a sore and scratchy throat and a pleasant settling of a queasy stomach. Lemon juice works to boost the electrolytes of the sea salt and helps keep the body cool and alkaline. Honey is such as well-known superfood that it hardly needs to be described. The sweet sticky ambrosia acts as a carrier to enhance the effectiveness of the other herbs and to sooth sore throats. And of course who doesn’t want a nice cup of chicken broth to warm away the autumn chills? To make: boil all ingredients together for 10 minutes, then strain. My family knows well that this wonderful remedy is best sipped slowly while warm for the gentle and welcome relief from many of the symptoms of colds and flus. If you have a sneaky streak, you can even use this recipe as a base for a warming Cioppino or other zesty autumn soups. I find this a great way to sneak this remedy into my family’s bill of fare and help keep them healthy without them even knowing! 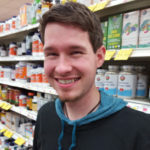 Dr. Chris Knutson, ND, entered the natural health field after being cured of chronic Lyme Disease by an Australian Naturopath. He holds degrees as a Doctor of Naturopathy, Master Herbalist and Certified Nutritional Counselor. He currently works as a Nutrition and Wellness Coordinator with Fresh and Natural Foods.